How do you get it serviced? From the company that sold it to me. I was thinking of selling my old IBM selectrid but after reading what you wrote I am going to think about that. They are suddenly going up in value…up to $450 depending on make, model and condition. I agree that there’s just something about a Selectric. It’s like a Harley – If I have to explain it, you wouldn’t understand. I’ve found myself writing more letters to friends and loved ones just to use my Selectric. Thanks for your comment. I agree wholeheartedly! I use mine with plain stationary that I emboss with my initial. I think it is great for sending personalized thank-yous. Everyone loves it and it’s a greta story. Long live my 1977 Selectric II! Amen to that! I also use it to type in forms. After spending 30 years constantly writing, my hand is just not as good as it used to be. Thanks for sharing! There are three old manual typewriters in my house. Two royals from the 30s or 40s and a portable one from the early 1970s. I find the older typewriters harder to use because you have to push pretty hard and quickly on the keys. Both of the old ones need repair and I cannot justify the hundreds of dollars it will cost to truly get them running smoothly. 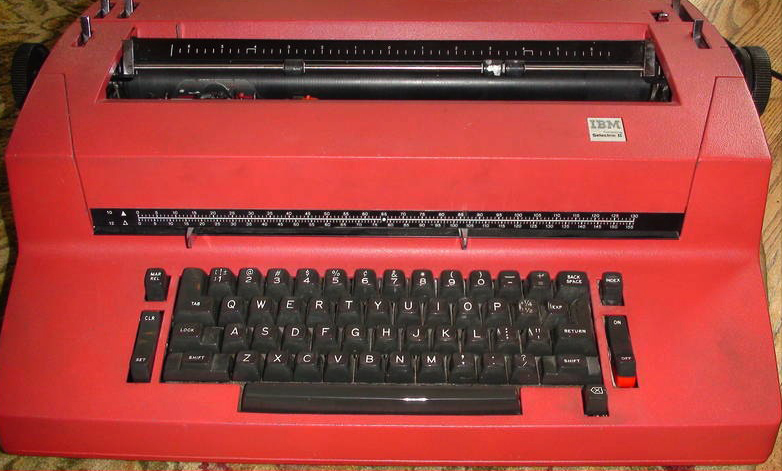 The joy of the Selectric is you can feel each key without having to type hard like on a manual typewriter. I use it all the time to type up envelopes, labels and even forms! The only people who do not laugh at my using a Selectric are secretaries. They miss those dearly, especially for a quick envelope, because it is easier than getting envelopes lined up right in a printer. Since I have been a writer for 30 years now, my hand is getting more tender and the spares me of having to use my writing hand anymore than I have do. Lord knows my handwriting is hardly legible at this point. Kimberely! Congratulations on being united with the Selectric of your dreams! You got a margin at $45 and I wish I could find a cover for mine. The man who sold me the machine just came over last week because I had to type up three-ply carbon copies of an IRS form. I am a sole proprietor but still have to issue 1099s once in awhile. Since my company is not large enough to justify a program that prints out the forms, I turned to my machine. Anyway, messed up the ribbon and correct tape and he came by…he still calls the machine his which I think is great. A quick fix and he was gone. But he always has a story for me. He mentioned a couple women who retired from their jobs because their Selectrics were taken away from them and the computer just did not do as good a job on labels, envelopes, etc. I mentioned the Selectric to a couple young receptionists at a doctor’s office today. They had never heard of the Selectric, but it made sense to them and they proceeded to talk about all the steps necessary just to print out one envelope! I enjoy manual typewriters above all, but I DO have a soft spot for certain electric machines. Just picked up an Olympia Electronic Compact 2, which has a margin style similar to the Selectric. I use them for envelopes and other quick jobs just like you! How funny! I just got an electronic compact2 a week ago from a garage sale for $5. I was all set to haggle and she said $5 and I almost swallowed my uvula. BAM! It’s in near perfect condition.